Now is the perfect moment for you to act on your own inspirations. The doors are open, while you walk through them with us by your side. Don’t delay or procrastinate, as all of the ingredients are ripe for your success. Everything and everyone is on your side, supporting your positive outcome. At first glance, our angel appears to be looking through a swirl of energy. It is almost as though she is peering through the fabric of Time, itself. In fact, Time is really a part of the cloth that covers her and dresses her. Time is the infrastructure of our life. Time makes up the roadways and paths and bridges and tracks. Timing is when the train arrives. Timing (not Time) is something that is acted upon by us. While it is not something that we bring with us or create or even manipulate with our own energy (we don’t create the train schedule), it is something we should stay ever aware of because we participate in Timing. We don’t want to miss the train. Before we arrive on the planet, we are given – believe it or not! – all that we need to learn the lessons that we’ve chosen to learn. Often impossible to believe, but we really do have our train schedule tucked in our pocket. The musical notes declared by our angel’s trumpet can be likened to the train whistle in the distance. It’s time to board! A few days ago, I saw a commercial for a gadget guaranteed to bring peace of mind to every parent of every teenager with a driver’s license. One plugs into the car’s dashboard a little box that transmits – and may even control – the speed and location of the vehicle. So if you don’t want your 16 year old driving over 55 mph, no problem. The moment she tries it, you get a text. If there is a governor switch on the car, then she’ll never get to 56 in the first place. Don’t want your 17 year old boy driving to places where he shouldn’t be? No problem. The moment he crosses your pre-set boundary through the miracle of GPS, you will receive an alert. I remember thinking: Wow. Why didn’t God think of this? How great would it be if the moment we put ourselves in some sort of physical or emotional danger, we were stopped in our tracks. Just not allowed to go there. In fact, He did think of it. He called it Timing. Timing the Whys. In our never-ending effort to do the right or best thing, each and every day we are filled with so many questions. Questions that begin with the word Why are more often than not about Timing. If you have a Why question, know that Timing in some form or fashion is most probably at least part of the answer. Why didn’t Sarah and I connect all of those months ago? Often it’s God’s governor that keeps us from rushing into a relationship with a wonderful person who isn’t quite wonderful enough, yet. They just need a little more time. Why did you lose a special someone or something just when it seemed as though your life was finally getting on track? Because it wasn’t time for that relationship or job or apartment or house or … The answer is that you would have boarded the wrong train. As much as we hate, hate, hate it, Timing exists for our protection. In actuality, we’re all 16 years old with Life’s car keys. We think we have the answers or certainly know what we want and what should be. When he doesn’t call or she falls for someone else, we stomp to our rooms and slam our bedroom doors. We have a tantrum. Why answers seem so much harder to swallow than others. For most Why wasn’t the timing right? questions, well, we may never know the specific answer. Yet, we can always know that it was for our protection and our soul’s growth. We can pray that, at some point, God will reveal to us a glimmer of that Why answer. This much, however, remains true: Whys have an expiration date. Why did they run out of the fried chicken before I got there? That concern lasts about 10 minutes. Why did she leave me? may last years. But they all have an expiration date, a time when Life has filled in the empty spaces and what was once a call of pain becomes a sigh of curiosity. Timing the Whens. Of all of the questions psychic advisors are asked, I would bet dollars to donuts the number one question is a variation of When? It’s also one of the most difficult parts of any reading. This is, in part, because the Universe’s time is not our time. It’s also because Timing really does work like ripples in a stream: One tripped over pebble can cause a mini-tsunami. Timing in a reading is based on the current aspects of any situation. There are a myriad of actions that can shorten or extend the time frame. I always share with my clients that, while we’ll be happy to offer a time frame, please remember that it really is a frame. The salient point of a reading will always be whether or not an event will or won’t happen. Being given a sense of When is the cherry on top! One More Turn. Always a tricky concept, this Timing thing, it’s sometimes easier to understand it if we imagine it like a kaleidoscope. That magical children’s toy, shaped like a tube, through which one can peek through the hole at one end to see sparkling wedges and circles and rectangles of cut glass. With each turn, each fall of the crystals, the image will change. What was an intricate geometric pattern or maybe just a cluster of colors is, with a single turn, suddenly a glorious image of rose. The first important lesson to remember is that until every fragment is in its perfect place, the image won’t appear. You can be waiting for that special someone and be completely ready to have that love in your life, but if that person still has lessons to learn before they can move forward or are slower in their own healing than expected … well, we may have to wait on that crystal to tumble and reveal the rose. The second important lesson? We may just be a single turn away from the rose. Enjoy the colors before you and know that you’ll soon enough see the rose. Don’t Forget the Schedule. Above all when we consider Timing we have to keep in mind that we have that schedule in our pocket. (Or likely crumpled in the bottom of our purse!) Whenever you begin saying to yourself that you are ready for love or ready for that new job or fill-in-the-blank, that is always a sign from the Universe, a nudge from your angels, that you are sensing that special someone or special event is near. You hear that train whistle in the distance and your schedule won’t let you down. All you have to do is show up on the platform! Our angel speaks to Perfect Timing. 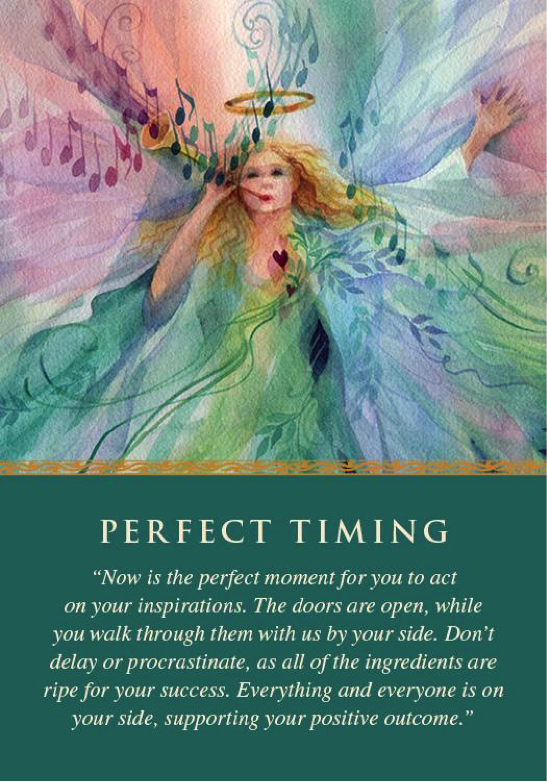 When we draw this card in a reading, it’s a heads-up that Timing is at play and currently highlighted in our lives. In this case, she tells us that now is the time to act. Make that call. Start that business. Go for that promotion. Make that move. Say hello to that someone. The doors are really opened for you. No pushing required! Our angel also sends a gentle reminder that, as we said earlier, you have to show up on the platform to catch the train. Time to leave the comfort of the station snack shop. Time to end your phone call. Time to pay your bill, leave a tip and slide off of the counter stool. Whatever you have been needing or wanting to do – here comes the train that will take you there. Take a deep breath and enjoy the ride! 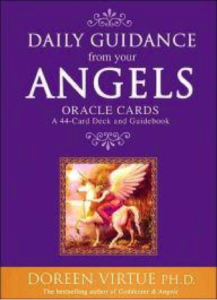 The Perfect Timing Angel Card is selected from Doreen Virtue’s Daily Guidance from your Angels deck.